Justice for my People” tells the story of Dr. Hector P. Garcia – Mexican Revolution refugee, medical doctor to the barrios, decorated war veteran, civil rights activist and presidential confidante- as he fought to bring attention to the Mexican American civil rights movement. Returning from World War II, Garcia found that his people faced public school segregation, squalid living conditions in labor camps, and second-class citizenship. 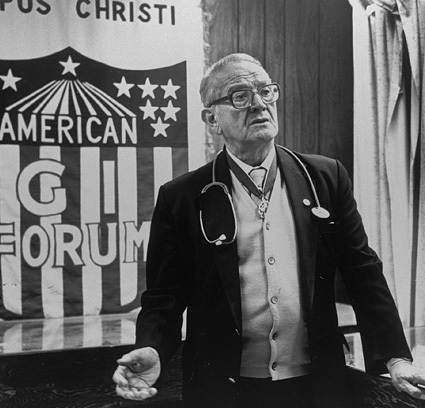 In 1948, he founded the American GI Forum, empowering Mexican Americans to fight numerous legal and political battles against discrimination. As he championed the rights of Mexican Americans, his life would be threatened. He would overcome personal tragedy. He would refuse to be thwarted by political setbacks and disappointments. The program is incredibly powerful and inspiring and uncovers the work that Dr. Garcia did during the same period in time The program archives is still unfinished and we would like to have it finished as soon as possible. Jeff Felts is Director of Television Productions for KEDT and has been a dynamic force on the station’s production team since 1986. He has produced programming on public affairs, children’s education and historical and social documentaries winning 1995 and 1996 international Telly Awards. Mr. Felts combines in depth knowledge of the South Texas cultural environment with over 20 years experience in public television production. For more information, please visit: www.justiceformypeople.org.